Jandamarra is a legend of the Bunuba people. We remember him as a great warrior, and as a clever and courageous leader who defended our country against overwhelming odds. We remember him as a Jalgangurru, a man bestowed with spiritual powers that flowed from the timeless law of our country, who could disappear, transform into a bird and shield himself from deadly weapons. He grew up at the time when the pastoralists were first laying claim to our country. It was the frontier; a time of violence and great upheavals. He was only in his mid twenties when he was gunned down, but in his short life he created a legacy that will never be forgotten. He was born around 1873. At about the age of 11, Jandamarra and his mother came in from the bush to live on Lennard River Station, one of the earliest pastoral stations in the Kimberley. Jandamarra became a strong horseman, a crack shot and a competent English speaker. But after this first taste of station life, he returned to join the Bunuba still living a traditional life, outside the control of the stations. He was caught up in a police raid, and served time in Derby in jail for sheep-stealing. When he eventually returned to his country, he worked at Lillimooloora Station with Bill Richardson. When Richardson joined the police force, Jandamarra became his tracker. As a tracker, he helped the police capture many of our ancestors – his own people – taken away in chains to distant gaols, many never to be seen again. It was in this period that he became known as a reckless womaniser who flouted the kinship and skin laws. His close but uneasy friendship with Richardson came to a dramatic end. In late 1894 the pair succeeded in capturing a group which included virtually all of the most senior Bunuba leaders and elders. During the night of October 31 1894, he chose to return to us. He shot Richardson, armed the Bunuba people and began a guerilla campaign against the European invaders. Jandamarra’s first major act of war was a direct confrontation – the battle of Windjana Gorge on November 16, 1894 – between 30 armed police and a large group of the Bunuba in which he was very badly wounded. He recovered, but the appalling and indiscriminate reprisal killings of Aboriginal people throughout the Fitzroy River valley led Jandamarra to develop different tactics. The Bunuba now targeted property, crops and stock, and harassed and ‘stalked’ the pastoralists without causing human casualties. In this way they tied down the progress of pastoral expansion for over three years. Jandamarra developed an almost superhuman reputation amongst white settlers and police for his ability to elude them. He was finally tracked down and killed on April 1, 1897 when the police brought in another Aboriginal tracker, Mingo Mick, who had equally legendary powers. It is over a century since he was killed. But he has been an inspiration to us down through the decades, remembered in stories, in dances, in songs traditional and contempory, and now in this play. Jandamarra’s extraordinary position – poised between the white and black worlds – makes him a compelling tragic hero. And it makes this story one of the most dramatic of all the tales of the 19th Century conflict between Aboriginal people and white settlers. 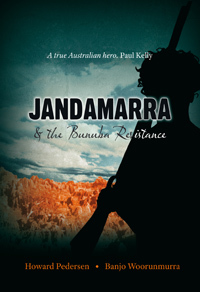 The definitive historical account of his story is Jandamarra and the Bunuba Resistance written by Howard Petersen in collaboration with Bunuba elder Banjo Woorunmurra, published by Magabala Books.